A New Trailer For OBLIVION, From The Director Of TRON LEGACY, Has Tom Cruise And Cool Flying Things! UPDATE!! A New Trailer For OBLIVION, From The Director Of TRON LEGACY, Has Tom Cruise And Cool Flying Things!! UPDATE NUMBER 2: The trailer is available (with subtitles) via Universal International's Youtube page. Embed below! 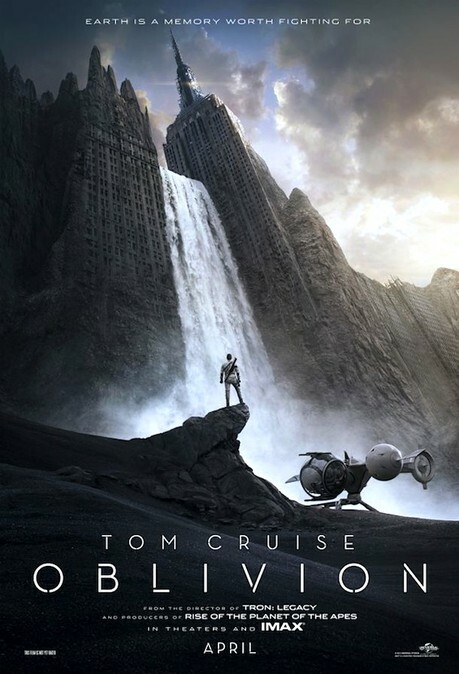 Here's a new (international) trailer for OBLIVION. The Tom Cruise-starring film comes to us from / director Joseph Kosinski (TRON LEGACY) and looks to deliver an equally unique and well-defined aesthetic universe. I'm very eager to see how this picture shakes out, and am equally curious about the 'gag' which has been hinted at time and time again in promos...I'm half-expecting some sort of TWLIGHT ZONE reveal involving 'memories' and whatnot...perhaps that future is not all that it seems? We'll see when OBLIVION opens on April 19.